significant effect - I'm listing here the luminance changes vs. a ref print kept in the dark and pretty much shielded off. peter D, PeterBJ, The Hat and 1 other person like this. Well, the inkjet printer prints by placing dots on the paper surface. No matter how you apply GO short of a roller or spray it will leave uncovered surface area. It matters not what color was chosen. If you need a better coverage ratio, you might want to make multiple passes with a GO cover image each with an offset but again there is no guarantee of complete coverage. Remember inkjet = intermittent dots. Not a continuous spray. Dots are "close" but not complete. GO optimizer was meant to fill in areas where there is no ink as opposed to covering the whole print, which as described above is still not possible if it was applied with an inkjet printer. So keep these points in mind when experimenting with GO. If you apply GO with a spare printer like an old EPSON 1400 and use QuadTone RIP using a custom curve I can apply a coat of GO that looks completely wet or one that is barely noticeable. The Custom Application QTR Curves control the amount. and I turned up the gamma pretty much to separate the actual black dots and the dot gain/ink spread around it, and there are some sparse small white spots with no ink coverage at all, looking to the histogram I get a number that these light areas don't cover more than 0.5% of the image. A 2nd overprint would cover those but I wouldn't expect too much additional gain from it, the paper surface is essentially covered with a GO layer already. to Aardenburg's findings about weak yellow pigment inks across the range of tested inks. 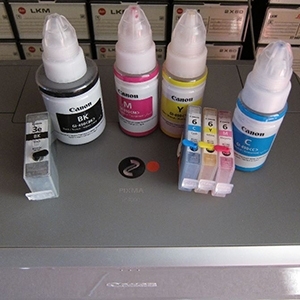 Epson calls it 'Gloss Optimizer' and Canon 'Chroma Optimizer', both effects of this 'ink' are visible and measurable. But no company is referring to an additional benefit of a better fading performance as well. Based on @jtoolman 's comments above I tested the GO overprint, I checked the 'ink' - GO coverage on the paper which appears to be pretty complete by printing via the black ink channel. And I'm testing the fading protection one or two layers of GO may give and whether that would make a difference. Apparent are reflection differences , there are no visible changes in colors when viewed directly , and the gamut between these print does not change, the spectro is operating with a viewing angle of 0 deg. The changes appear when turning the print against reflecting light, the print with 1x GO looks like viewed through a glass screen, and the print with 2x GO looks almost like the one w/o GO at all , the 2nd overprint takes that glassy look away again. Please consider all this experimental at this time, it might be interesting to do some more testing but I'm not recommending it at this time for general use. So I looked again to the patches now after 4 weeks with and w/o GO overprint - black starts turning into a chocolate brown unprotected - the protected patches don't show a relevant shift yet - regardless of 1x or 2x overprint, so it needs some more ozone whatever to show possible differences. The Hat and palombian like this. It's the same situation after 6 weeks - the patches w/o GO overprint are fading along - as expected, the patches with 1x or 2x GO don't show signs of fading yet. I had a look to some other aspects of the GO application, as mentioned before, it makes visually perceptible differences - and these are different with 1x or 2x overprints. Epson and Canon are advertising this clear ink as a gloss or chroma optimizer in context with pigment ink prints. There is another effect that the GO overprint can improve the fading of dye ink prints very much, and the GO has impact onto the overall gamut of a print. no GO - L=12 1x GO - L=10, 2x GO - L=8 wo that's quite some gains, the improved black level and wider gamut for darker colors becomes visible test prints in direct comparison. And there is a visual difference as well - 1xGO takes away the bronzing of pigment inks, improves the blacks and balances gloss differences between areas with different ink densities to a degree. 1xGO in unprinted areas e.g. edges around the print or or white areas in the print changes the look of the paper white. Prints with 2xGO overall look slightly better to those with 1xGO, the glassy look of the paper white is gone, there is not much further visible difference between 1xGO and 2xGO prints, the differences in gamut are only visible in direct comparison. no GO - 5 _ 1 x GO - 7 _ 2 x GO - 8 - the black level is weakening, effects all opposite to those above with pigment inks. And how does it look - the 1xGO is changing the look of the paper white (glossy) , and prints look as if they are behind glass, color changes are not visible, this glassy look is gone with 2x GO , such prints look somehow better than those with 1xGO (just my personal preference). The GO benefit on dye inks is not so much in the gloss appearance, bronzing etc, the only benefit would be a significant protection against ozone of weaker dye ink prints as shown in the other thread. the latest Ultrachrome pigment inks for the P600/800 and alike printers. by farbenwerk, Lyson, PC, Vermont Ink or else provide this improvement of the yellow pigment inks as well. Fenrir Enterprises, The Hat and Flying Scotsman like this. I would like to thank you once again for all the time and work you put into these tests. They are invaluable for us who are refilling and wanting the best possible quality. I have so far not seen any comments in this respect by 3rd party ink suppliers whether their Ultrachrome HD compatible inks offer a similar improvement of the yellow pigment inks. Several of those have already advertised that they did improve or exceed the black level of their inks vs. the Epson HD inks.